Welcome to the champagne snow capital of Canada - Kicking Horse. Kicking Horse Mountain Ski Resort has expanded significantly over the last few years offering some excellent ski-in and ski-out ski accommodations to choose from. We work with the Kicking Horse Vagabond Lodge bed and breakfast to bring you exceptional service and the Palliser Lodge for self-catered options. These are two ski accommodation choices which will not disappoint. 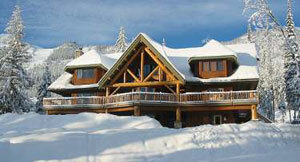 Contact us for more information on these Kicking Horse ski accommodations or to book. Take the Kicking Horse Powder Express from Banff or Lake Louise to experience Kicking Horse Mountain Ski Resort in a day for little more than the cost of a lift pass. Alternatively, you can take this service one way from Banff or Lake Louise to make Kicking Horse part of a twin-centre ski holiday in Canada.